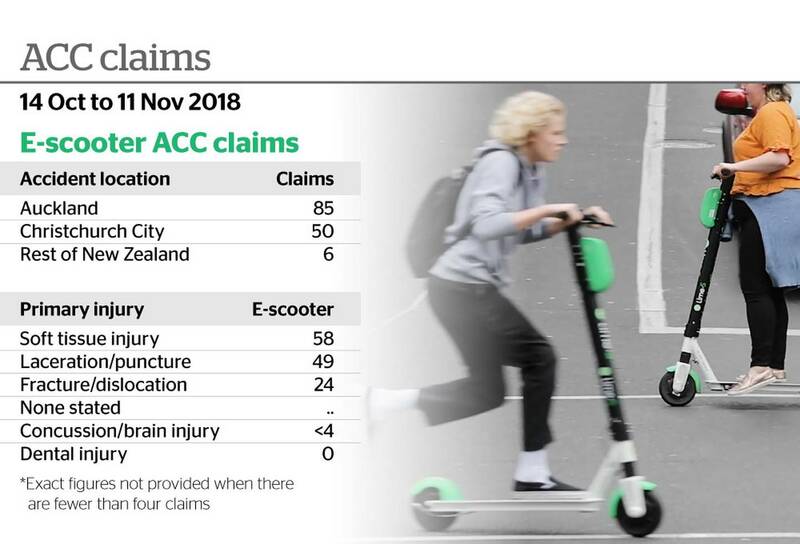 Nearly 150 ACC claims for injuries caused by electric scooters have been lodged in the month since Lime e-scooters launched in Auckland and Christchurch. The bulk of injuries occurred in Auckland (85 injuries), while 50 were recorded in Christchurch and six across the rest of the country. The data was for claims made between October 14 - when Lime began hiring out electric scooters - and last Monday. An ACC spokesman said the injuries were only an estimate because its data relied on people self-reporting what caused their insurance claim. The high injury rate comes as even more fleets of electric scooters are set to hit Auckland's streets. On Monday, Chinese electronics giant Xiaomi, or "Mi" as many know it, opened its first New Zealand store and sold $257,750 worth of electric scooters in just seven hours. About 200 of its $599 scooters sold online in 30 minutes, causing the retailer's website to crash. The Mt Wellington store opening was also greeted by about 1500 people queuing to get inside. Mi New Zealand spokesman Eric Chang said Mi scooters were safer than their Lime alternatives, as they had built-in safety features such as headlights, dual-brake systems and had to be manually pushed to a speed of 5kmh to start. The scooters have a range of 29km and can travel up to 25kmh. "Safety is a key consideration in the design and operation of the scooters," Chang said. "The front anti-lock braking system prevents the wheels from locking even under hard braking or on surfaces with low friction like wet roads." Earlier this week, fellow Chinese manufacturer Okai was the subject of a global recall of its scooter models. A spokeswoman for Lime said in a statement at the time the company was working with international safety agencies following reports the Okai scooters could break apart while in use. "Safety is Lime's highest priority and as a precaution we are immediately decommissioning all Okai scooters in the global fleet," the spokeswoman said. "The vast majority of Lime's fleet is manufactured by other companies and decommissioned Okai scooters are being replaced with newer, more advanced scooters." It comes as Auckland Council and Auckland Transport have warned they will be reviewing Lime's licence to operate 600 dock-free electric scooters. The company was initially given a three-month licence to operate, much the same as the trial licence given to the OnzO bike sharing service with its yellow-and-black hire bicycles. Auckland Council's manager of street trading Peter Knight said his team was likely to amend the conditions under which Lime must operate when the three-month trial was up. "If the licence is extended, we will likely further amend the code of practice to ensure that the scooters are benefiting Aucklanders and visitors and that any issues caused are addressed," he said. "The main differences between e-scooters and bikes are that e-scooters are classified as wheeled recreational devices under the Land Transport User Rule." "Due to their wheel diameter, they can be used on the road, footpath, cycleways and shared paths." Because of their stupid little wheels is probably why they have so many crashes. They drop into every little depression and tip the rider over the front. Cant figure out why the makers cant see that. Bigger wheels are safer, thats why bikes have large ones.